Justin Bieber's people have smartly tried to contain the teenage singer's hijinks by attempting to make it clear to anyone who parties with him ... any pictures snapped are automatically the property of Justin. 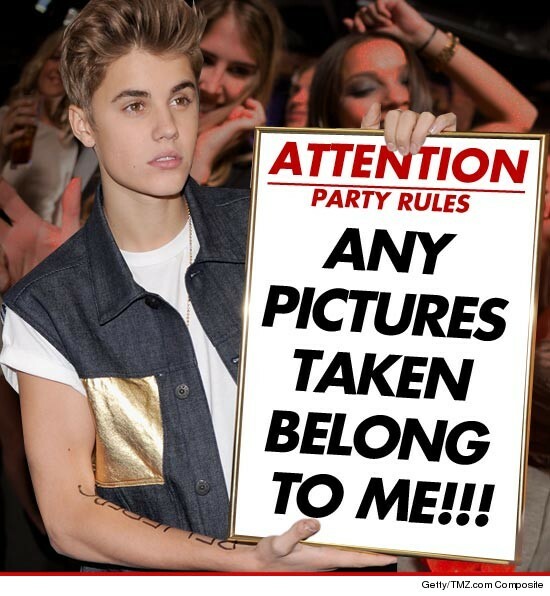 Sources familiar with the situation tell TMZ ... Justin's people routinely place a sign in places where Justin parties -- a sign that says any and all photos taken at the party do NOT belong to the people who took them -- they all belong to JB. It's a literal and figurative sign of the concern Justin's people are showing for a famous teenager with a penchant for risk-taking. As for the photos taken last week in that Newport Beach Hotel room showing Justin smoking a blunt, our sources say if there was a sign it wasn't obvious ... because the people who took pictures saw nothing. In addition to signage, we're told Justin's security people are supposed to "manage" private situations like the one in the hotel room, but apparently security didn't do its job ... or they've been co-opted by Justin.